Installing and activating our woocommerce product feed manager is really easy. Just within a few steps you will be up and running with the feed manager. Remember that the plugin will only work if you have the woocommerce plugin installed and running. Activate the feed manager plugin. 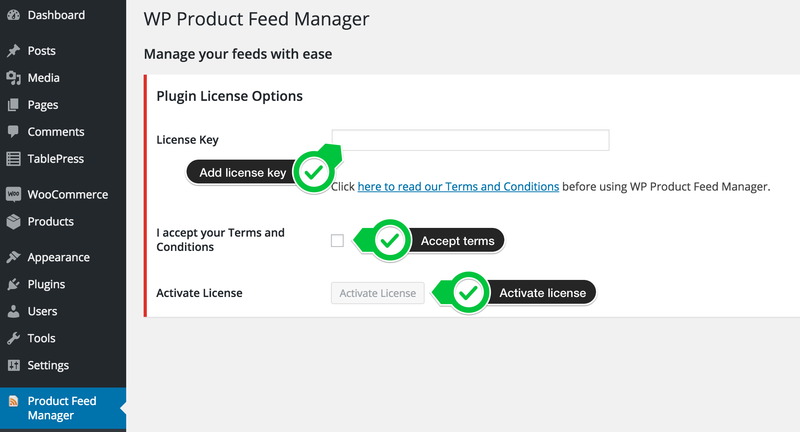 You will need a license key to activate the woocommerce product feed manager plugin. You will find the license key in the purchase e-mail and will be able to access your license key in your account on our website. Open your plugin folder with your favorite ftp client. Overwrite the trail plugin folder with the new premium folder. With these steps you will keep the feeds you have created in your trail version. Keep in mind that the premium version will have a set of new features and you should make sure you make advantage of them. An other methode is to simply deactivate and delete the trail version and install the premium version as you normally would. This way you do not need to have ftp acces but if you will lose the feed setting you have earlier created in the trail version.